Want more than just one day? Then apply for an extended orientation! 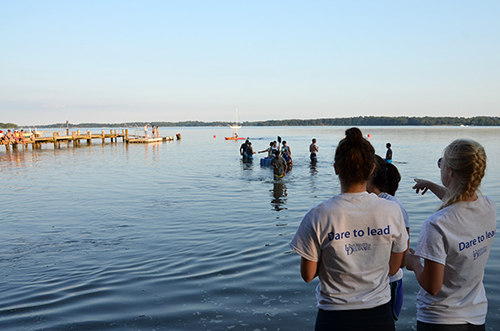 These cool opportunities provide incoming first year and transfer students with the ability to strengthen their transition to the University of Delaware through experiences that match their interests and abilities. 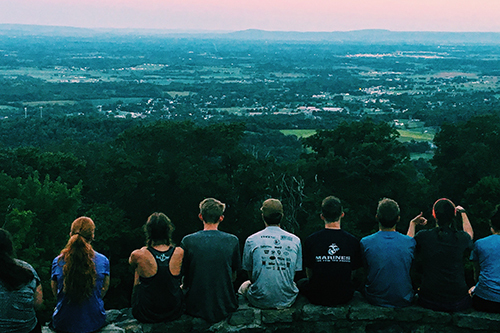 While the approach may be different between the programs, the benefits are the same – new friends and mentors, great conversations and an opportunity to kick off your college experience with an adventure! 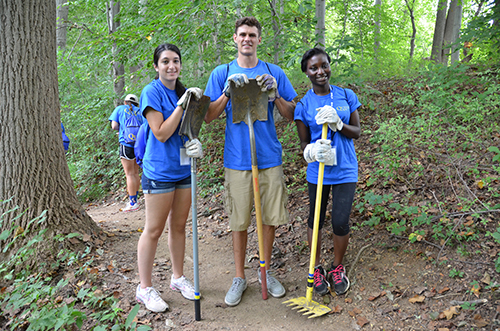 Summit is an extended outdoor orientation experience for first year students at the University of Delaware, designed to further ease the transition of new Blue Hens into the campus community. Summit is led by student leaders dedicated to fostering an environment where students can connect with their new peers in a fun and challenging way. 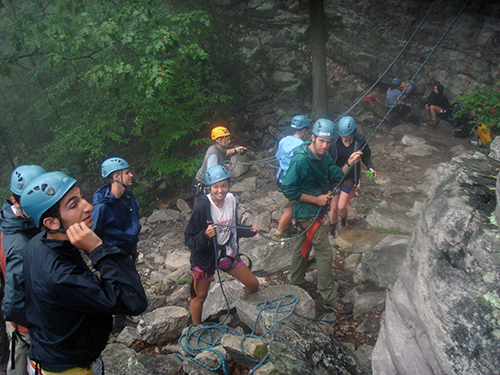 Before and after they take to the trail, Summit participants will learn about themselves, each other, and the tips and tricks they need to be successful in their college journey. Each Summit experience will consist of up to 12 first year students, as well as three of our Summit Leaders. 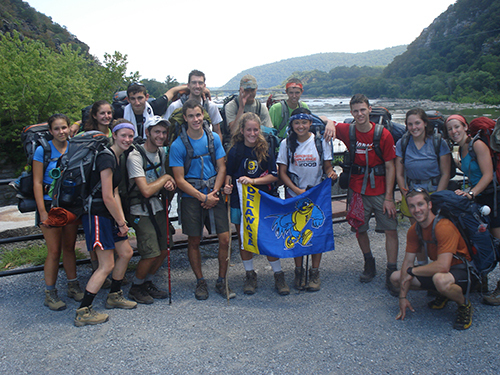 These trained student guides, who are both Wilderness First Aid and CPR certified, will take you safely across Maryland and into your first year of college. The Summit experience will start with two days of on-campus activities and backcountry lessons to prepare you for the adventure ahead. The next five days will be spent trekking the entire Maryland portion of the Appalachian Trail. Summit is available to all incoming first year students. Although you do not need to be an experienced backpacker to participate in Summit, you must be physically able to walk 8-10 miles per day if you choose to participate in the Summit: Adventure experience. 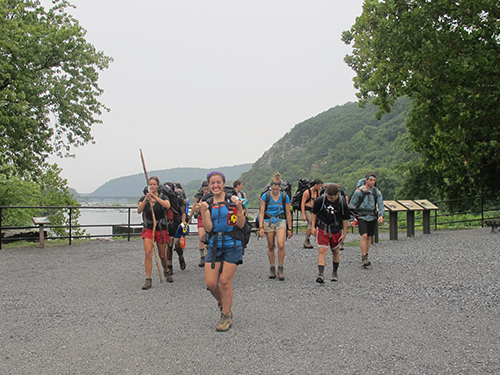 Over the course of the 5 days on the trail, students will hike approximately 50 miles and will be carrying all of their supplies in a backpack. 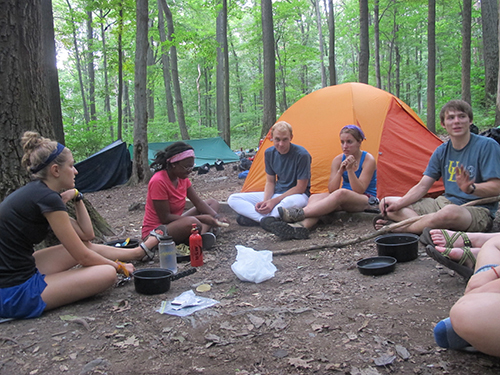 The Summit: Basecamp experience is perfect for students who are less experienced with wilderness exploration and looking for a low-pressure way to enjoy the outdoors with new friends. The 2019 Summit Application will be available May 1. Students selected to participate in Summit will be placed in one of these four trips based on the availability they indicated on their application. *Limited financial support is available to those who qualify. Email otp@udel.edu for more information. Summit is available to all incoming first year students of every experience and skill level! As an extended outdoor orientation program, Summit will require students to use both simple and technical backpacking equipment. During the experience, students will be separated into tent groups and provided with the necessary gear to function on the trail as a team. However, there will be a number of personal gear items that students must either bring themselves or rent from the Office of Orientation & Transition Programs. We will have backpacks, sleeping bags, sleeping pads, and headlamps available for rent. You must have your own hiking boots and appropriate clothing for the trail. A packing list of the clothing and equipment you will be expected to bring can be found in our Gear Guidelines [PDF]. If you are unsure whether what you already have is adequate after reading the Gear Guidelines, email us at otp@udel.edu. If you have additional questions about Summit, feel free to call us at 302-831-3313 or email otp@udel.edu. QUEST is a year-long transition and leadership opportunity for incoming first-year students that begins with a 4.5 day program preceding 1743 Welcome Days. Get an early start in self-discovery and leadership development, and build confidence that supports a successful student experience! understand that developing as a leader is a process that involves self awareness, relationships, skills, service to others and transformation. QUEST 2019 will take place August 20-24. The 2019 QUEST application will be available May 1. The cost to participate in QUEST is $350. Limited financial assistance may be available to students who qualify. 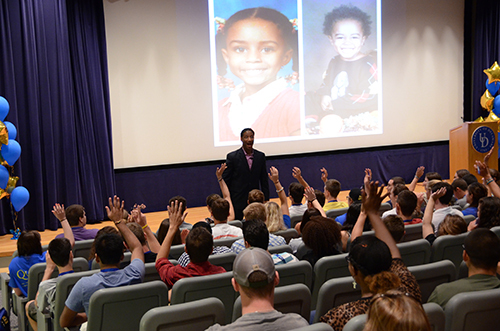 QUEST is offered through the University Student Centers’ Leadership Development office. Applications for new QUESTers are accepted for incoming first year students each summer. More information can be found on the USC’s QUEST page. Summit: Seaside is an extended orientation experience for students transferring to the University of Delaware, designed to further ease the transition of new transfer students into the campus community. 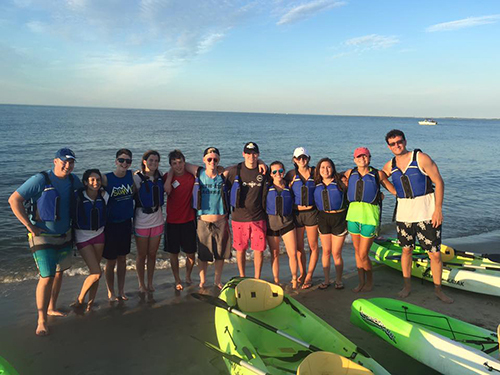 Current UD students and staff facilitators will help you make meaningful connections with your peers as you spend the weekend beach camping and sea kayaking in one of Delaware’s beautiful state parks. 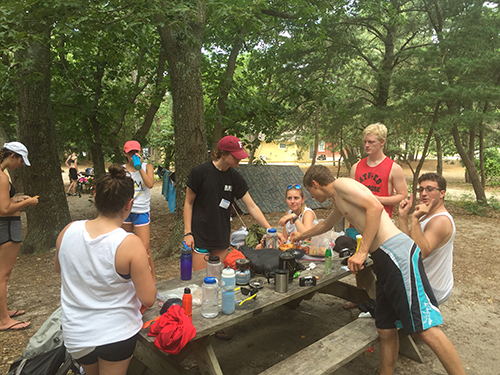 Summit: Seaside takes place at Cape Henlopen State Park in Lewes, Delaware. The state park is located about an hour and a half southeast of UD’s campus. The program is facilitated by two student leaders who are Wilderness First Responder trained, as well as a staff member from the Office of Orientation & Transition Programs. The Summit: Seaside experience will begin with a day and a half of on-campus activities, and end after 2 days spent camping beachside. Summit: Seaside 2019 will take place Thursday, July 11 – Sunday, July 14. The 2019 Summit: Seaside application will be available May 1. The cost to participate is $250. Limited financial support is available to those who qualify. Email otp@udel.edu for more information. Summit: Seaside is available to all incoming transfer students. 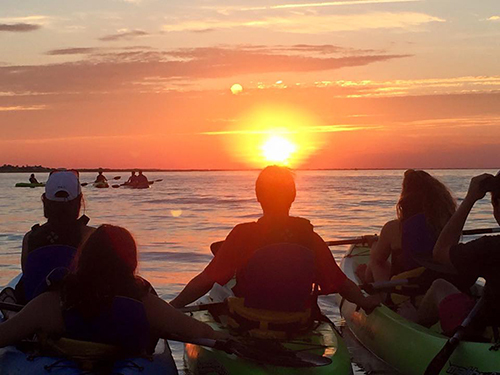 As an extended outdoor orientation program, Summit: Seaside will require students to use outdoor equipment, such as kayaks, which will be provided. During the experience, students will be separated into tent groups and provided the necessary gear for their group (tents, camp stove, etc). However, students will also need personal gear items such as a backpack, sleeping bag, and sleeping pad for this experience, all of which are available for rent if the student does not have their own gear. A packing list will be provided to participants when they are notified of their selection. If you have additional questions about Summit: Seaside, feel free to call us at 302-831-3313 or email otp@udel.edu. 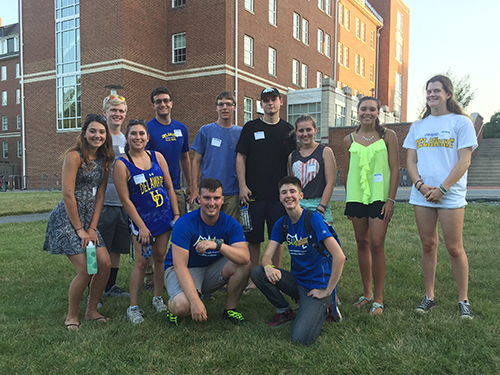 Orientation & Transition Programs is part of the Division of Student Life, which contributes and facilitates critical learning and development within healthy, inclusive and supportive communities so that all students may thrive at UD and beyond.